I've been out of the loop for a couple weeks. How is everyone doing? Dave and I locked in a rate on our new home yesterday. I'm glad the worrying and negotiating is over. Of course we have not reached the end of our troubles yet...we're finding things in the house that aren't as we expected, and we're not overly happy with the builders right now due to the closing date (currently estimated to be middle of September). But that's a long story for another day. You can see updates on the house here. This week was a sad one. Our next door neighbor, a guy in his thirties, suddenly died in his apartment. Dave came home Tuesday to find a ton of cop cars and a CSI van in front of our apartment building. The whole situation is a bit crazy. You can read about it here. Please pray for his wife, who I'm sure is hurting greatly. On a happier note, I need to do my giveaway!! I've been planning it for quite some time, but I wanted to save it for a Company Girls' day so all of you could participate. Isn't it cute? I really love the design. 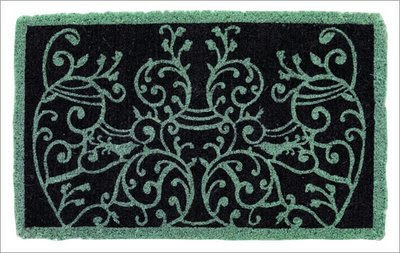 It's from CSN Rugs...if you're looking for an area rug, they're a good online store to check out. They have quite a selection. So here are the rules: Just leave a comment on this post sometime within the next 7 days. I'll give everyone until midnight of next Thursday. Friday I will randomly select a winner from the people who have left a comment. For anyone reading this from the automatic upload on Facebook, please go to my actual blog at www.thekssblog.blogspot.com to enter. Only one entry per person, please. We're refinancing right now...lots of paperwork. Sorry to hear about your neighbor. I hope that Candie has family in the area to help her out...or a caring support system at this time. My prayers go out to her. That is a cute rug. I love giveaways! Oh my goodness - what a week you've had. Refinancing is busy enough - and your neighbor's situation is so sad. Will be praying for his wife. So nice to hear that the house is coming along.....it must be quite horrible for your new neighbor though...expecting your first on your own must be quite terrifying. The outdoor mat looks fabulous! So glad the house is closing in on you :) My husband has decided that he wants to build a little Mexican villa after visiting San Diego...though it will be a long while before we get around to that! Sign me up! That rug is super-cute! I'll definitely be praying for that woman, it would be terrible to lose your husband like that. Hey, another Debbie posted, NOT ME :) this is DSL and that rug is fun, and I want it :) I told brian to post too but he's too shy! Yay for giveaways and yay for locking in your rate!! Hey Kara! That's exciting you finally got a rate you were ok with! Hopefully they'll get finished with the house before their projected finish date. The rug is cute! It'd look great at my front door :) Hope you and dave are doing well! How fun that you get to do a giveaway - count me in for the drawing. Hope the house continues to move along well for you guys!